Download these universal Lightroom Wedding Presets to improve your images and make them beautiful and stunning in just several clicks. You can use these original wedding filters in the full Lightroom desktop version as well as for LR Mobile. 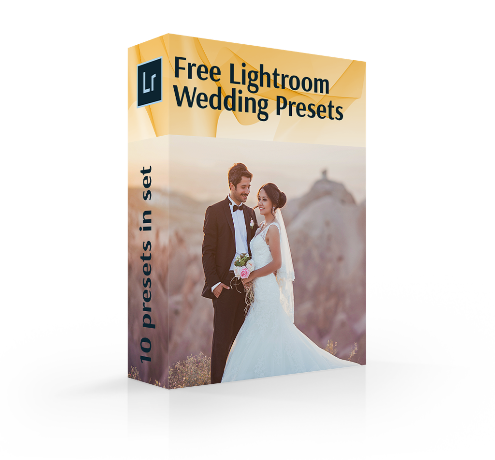 Download this package of 10 Lightroom Wedding Presets free of charge and your image editing workflow will become easier and twice faster. 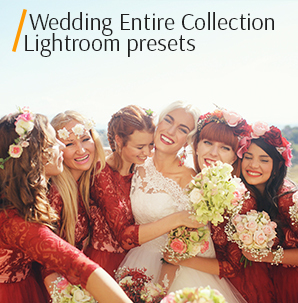 We offer you a set of 10 Lightroom Wedding Presets. It is possible to apply these filters to various wedding images (engagement, couple, wedding party, etc.) and fix color, lighting, and other problems connected with overexposure. All Lr presets are universal and can be easily adjusted for your photographs. Enhance your wedding pictures, get rid of small light flaws in just a few clicks with these amazing Lightroom Presets. Lr Preset #1 "Cold Wind"
Lr Preset #2 "Sunny Day"
Lr Preset #5 "Matte Effect"
Lr Preset #8 "B&W Essential"
Lr Preset #9 "Vintage Style"
Lr Preset #10 "Warm Filter"
Even after the most successful wedding shootings, photographers need much time to enhance the photographs – make photo culling, color correction, and basic photo editing. To reduce the time you spend on picture editing, we have prepared for you a special bundle of Free Lightroom Presets Wedding. You can find the Lr plugins that are perfect for your photographs. They can fix any problem practically in no time. The bundle consists of LR presets for outdoor and indoor photos, a black and white plugin, Lightroom presets VSCO, LR vintage filters and more. The process of wedding picture editing is complex and some photographers don’t believe in the power of LR filters. Free Lightroom Preset #1 "Cold Wind"
Use this wonderful filter if your couple or guest photos do not have enough light and look gloomy and dull. This free wedding preset makes your pictures lighter and softer. Avoid using it with studio photos. Free Lr Preset #2 "Sunny Day"
A soft yellowish tint will give your bridal and couple images warmth and softness. This is one of the best free wedding Lightroom presets that mutes bright colors so it is great for images with too rich tones. We do not recommend this Lr plugin for dark images. Free Wedding Preset #3 "Contrast"
By applying these Lightroom wedding presets you can emphasize the couple’s beauty and complete the image. It is a great choice for the photos with insufficient contrast and vibration. Be careful and do not apply this filter with bright and saturated images. Free Adobe Preset #4 "Cloudy"
To give a more professional look to your photos, use this Lr filter for wedding pictures. Its main feature is split-toning which gives the shadows and highlights a special color. These are the examples of the best presets for Lightroom, which are usually used by professional retouchers during the portrait enhancing. The whole presets are created by specialists and are meant to be used exactly for portrait retouching. 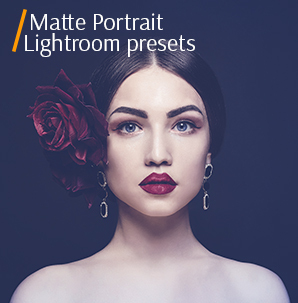 If you need really good portrait Lightroom presets free, download these ones and you will make great progress in photo retouching. Free Wedding Lr Preset #5 "Matte Effect"
Matte Lightroom wedding presets are recommended for the photos with very sharp colors. They soften the lines, lighten the saturated colors and give a gentle look to your images. Highly recommended for bridal portraits and baby photographs. Free Lr Preset for Weddings #6 "Soft Skin"
We recommend applying this type of Lightroom presets weddings for the images that have problems with white balance. This Lr filter influences on the dark areas of the picture. If white colors dominate in the photo then you should not use this plugin. Free Adobe Lr Preset #7 "Greenery"
These cool wedding Lightroom presets will help you correct flaws in the photos taken on the overcast day or in dim light. The Lr filter adds some light shades and saturates green tones. But it is not suitable for the wedding images taken on a bright sunny day. Free Lightroom Preset #8 "B&W Essential"
Classic b&w presets are very popular among wedding and portrait photographers. This Lr filter allows you not only to focus on the newlyweds but it will make the image more emotional and touching especially in harsh light. It won’t suit night pictures as they will get too dark. Free Wedding Preset for Lightroom #9 "Vintage Style"
Vintage Style Lightroom preset works great with the photos taken near water or against a blue sky. It adds a bit of brown and yellow shades that give the photos a trendy vintage look. Lightroom Free Preset #10 "Warm Filter"
This Lr filter affects the values of shadows and highlights as a result of which you get a clear image with excellent contrast. This wedding Lr preset is awesome for outdoor photos taken in dim sunlight. Try this amazing filter and get impressive results. Saves time. By using LR plugin you can immediately make your image 85-90% edited. Sometimes using presets is enough to give your photo a professional look and turn it into a stunning masterpiece! Variety. Wedding presets will provide you creative possibilities that will let you lay on various styles and see which is suitable for a particular picture or the entire photo shoot. Full customization. All the filters can be easily customized and the changes happen just in few seconds. Batch image editing. The ability to edit several photos at the same time by using synchronization is one of the most significant advantages of LR. The combined use of ready-made Lightroom wedding presets and batch editing allows you to speed up the process of photo color correction and achieve the desired results in the shortest possible time. 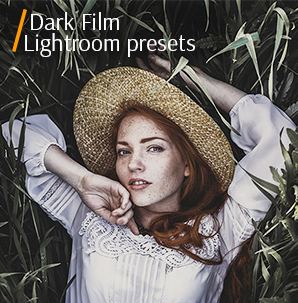 Would you like to have extra Free Lightroom Presets? Find out what we offer.